Some people say one vote won't make a difference. We say the only vote that doesn't count is the one you don't cast. Count yourself in on November 8th. This November, the US will hold one of the most contentious presidential elections in history. Here at Beyond, we’re passionate about social responsibility. That’s why, during this crazy election season, we wanted to make sense of all the data floating around and answer the question: What’s one vote really worth? To answer this question, we built Count Yourself In. It’s a small tool for people in the states to get information about their state’s voting history, current poll data, a live projection on their candidate’s chance of winning the electoral vote in their state and, of course, registration information (it’s not too late!). Some people say one vote won’t make a difference. We say the only vote that doesn’t count is the one you don’t cast. And remember, even in states that are “safe,” your vote can help to elect officials that reflect your views on every level: borough, town, city, state and federal. 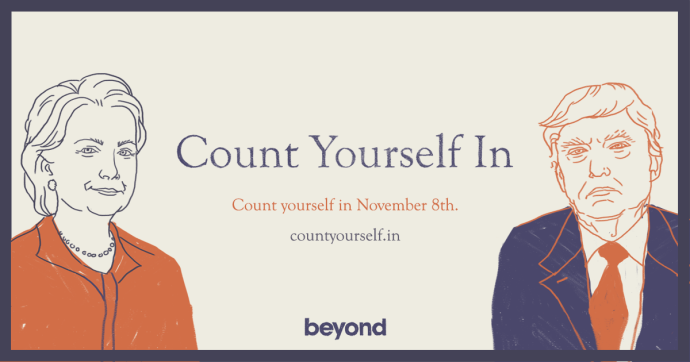 So check it out, share with your friends, and count yourself in on November 8th! !